The recipe below has become quite a regular one for me. I love using the slow cooker. It makes for delicious, healthy and really easy to make recipes. 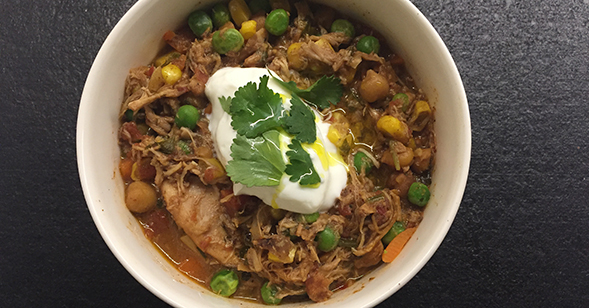 This recipe has been modified from another recipe I found online, I altered it to suit the slow cooker – where you can just throw all the ingredients in together and 8hrs later, a delicious meal is ready! Place all ingredients in to a slow cooker and combine together. Set on a low heat and cook overnight or during the day for 8hrs, and then dinner is served!! Serves approx 6-8 people. Serve with steamed or baked vegies for when having at home or even mix in frozen diced vegies (like shown in the picture). I also freeze portions, adding in diced frozen vegies, for a complete meal for when i am on the run or want back-up meals ready in the freezer. I also add flaxseed oil or flaxseed meal, to each meal for an omega-3 boost.